A recent Sukkot event at Har Bracha in the Shomron saw dozens of Christian volunteers join families for their annual harvest. In cooperation with the Har Bracha community in the Shomron (Samaria) and Rabbi Eliezer Melamed, the head of the Har Bracha yeshiva, dozens of Christian volunteers from the United States joined families in the year's annual harvest of crops. Tommy Waller led his group of volunteers from HaYovel, an international humanitarian organization which supports farming in Yesha (Judea and Samaria). Despite previous accusations that HaYovel were a missionary group, Rabbi Melamed described the event as "a blessed phenomena of non-Jews seeing the truth and pledging themselves to help the Jewish Nation in the heartland of the Jewish Land." "It is specifically on Sukkot that we merit this, because Sukkot is Chag HaAsif (the holiday of ingathering). 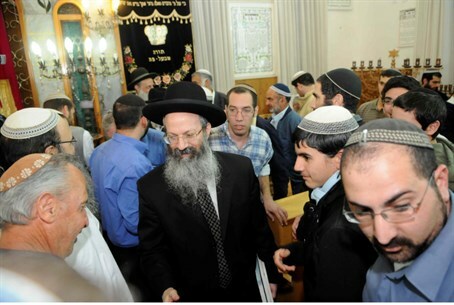 This is when both the physical and spiritual ingathering of the year are completed," Rabbi Melamed said last week in an article in B'Sheva, Arutz Sheva's Hebrew newspaper. At the event in Har Bracha, 14-year-old volunteer, Josiah Hilton, spoke to the crowd of people and thanked the residents of Har Bracha for "making the decision to live in Israel's heartland and for believing in the promises of God and following His Torah." "Our group of 300 volunteers is here to serve you, the Jewish people and make a statement to the world. We believe that Hashem gave you this land as an everlasting covenant. No matter what international pressure you receive, we will stand with you. We feel that Christians have too long either stood by and been silent, or have helped in the evils that have been done against you. We are here to say no more!"